The Sportster has been a bobber, a chopper, a scrambler and a café racer; a hero on flat tracks and drag strips and road-race courses; an accessible entry-point for first-time riders, and a custom cruiser. 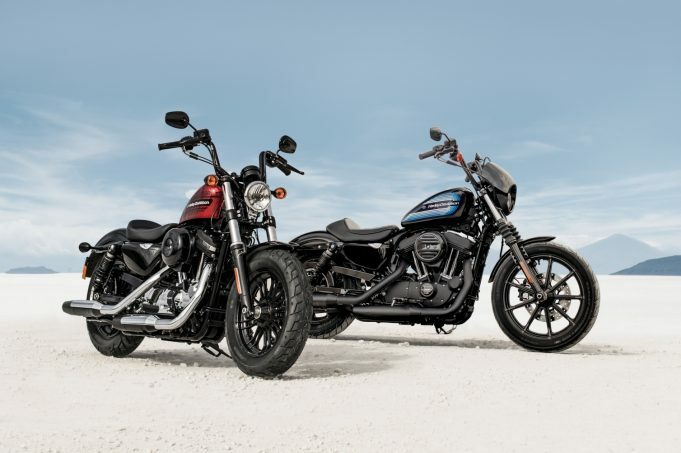 Now Harley-Davidson is launching two more, the Iron 1200 and the Forty-Eight Special, with both bikes featuring high handlebars and custom graphics, throw-back designs and plenty of modern performance bits. The new bikes, the latest in a line of 100 high-impact motorcycles the company plans to introduce by 2027, are powered by the Evolution 1200 V-Twin engine and have a real custom bike feel. New fuel tank graphics distinguish both the Iron 1200 and the Forty-Eight Special, and combine bold colour stripes with a formal typeface, colour and graphic elements originally popular in the 1970’s. In the case of the Iron 1200, the new ride brings more punch to the street fight – more power to blast away from green lights and more mid-range to muscle through traffic. More power means more disruptive fun. The jet-black Mini Ape handle bar is an essential element of the garage-built chopper look that adds instant attitude and the gloss black speed screen framing the headlamp is a West Coast styling influence that amplifies the attitude of the tall bars. A classic 3.3-gallon Sportster fuel tank features multi-coloured striped graphics that wrap around the tank profile, and is available in Vivid Black, Twisted Cherry and Billiard White, with the entire power train in black. Chrome pushrod tubes and tappet covers are the only bright work and highlight the V-Twin engine shape. The Iron 1200 is finished with all-black 9-Spoke wheels (19-inch front and 16-inch rear diameter) and a solid black belt guard and rear sprocket. It’s new pal, the Forty-Eight Special, features a burly front end – a 130mm front tire framed by 49mm forks secured in huge forged aluminium triple clamps – which looks especially menacing when topped with a gloss-black, 7.25-inch high Tallboy handlebar. Here there’s a 2.2-gallon “peanut” Sportster fuel tank features rows of bold, horizontal stripes framing a simple Harley-Davidson text logo. The fuel tank is available in Vivid Black, Wicked Red, and Billiard White. The Evolution 1200 engine features a black top end and an expanse of brilliant chrome below, including chrome primary, inspection and derby covers, and solid chrome muffler and exhaust shields. Chrome lower rocker boxes, pushrod tubes and tappet covers contrast with the black cylinders to highlight the V-Twin engine shape. High-performance Michelin Scorcher 31 tires front and rear are mounted on Black Split 9-Spoke cast aluminium wheels. The Harley-Davidson Iron 1200 and Forty-Eight Special motorcycles will start rolling into showrooms from the end of April 2018.